A Trip to the Moon (French: Le Voyage dans la lune) is a 1902 French black and white silent science fiction film. It is loosely based on two popular novels of the time: From the Earth to the Moon by Jules Verne and The First Men in the Moon by H. G. Wells. It was written and directed by Georges Méliès, assisted by his brother Gaston. The film runs 14 minutes if projected at 16 frames per second. A Trip to the Moon was extremely popular in its day and is the best-known of the hundreds of fantasy films made by Méliès. It is also considered by many to be the first science fiction film, and utilizes innovative animation and special effects. The story is of a trip to the moon. At a meeting of astronomers, their president proposes a trip to the Moon. After addressing some dissent (by throwing paper at a heckler), six brave astronomers agree to the plan. They build a space capsule in the shape of a bullet, and a huge cannon to shoot it into space. The astronomers embark and their capsule is fired from the cannon with the help of a bevy of beautiful women in sailors outfits. The Man in the Moon watches the capsule as it approaches, and it hits him in the eye. Landing safely on the Moon, the explorers get out of the capsule and watch the Earth rise in the distance. Exhausted by their journey, the astronomers unroll their blankets and sleep. As they sleep, a comet passes, the Big Dipper appears with human faces peering out of each star, old Saturn leans out of a window in his ringed planet, and Phoebe, goddess of the Moon, appears seated in a crescent-moon swing. Phoebe calls down a snowfall that wakens the explorers. The explorers then seek shelter in a cavern and discover giant mushrooms. One astronomer opens his umbrella; it promptly takes root and turns into a giant mushroom itself. At this point, a Selenite (an insectoid alien inhabitant of the Moon) appears, but it is easily killed by an astronomer, as the creatures explode if they are hit with a hard force. More Selenites appear and it becomes increasingly difficult for the explorers to destroy them as they are surrounded. The Selenites arrest the astronomers and bring them to their leader. An astronomer picks the Chief Selenite up off its throne and dashes him to the ground, exploding him. The astronomers run back to their capsule (continuing to whack the pursuing Selenites on the way). Five get inside. The sixth uses a rope to tip the capsule over a ledge on the Moon and into space. A Selenite tries to seize the capsule at the last minute. Astronomer, capsule, and Selenite fall through space and land in an ocean on Earth! The Selenite falls off and the capsule floats back to the surface, where they are rescued by a ship and towed ashore. The Brian Selznick book The Invention of Hugo Cabret features a description of the "man in the moon" scene. Martin Scorsese's film adaptation also prominently features this scene. 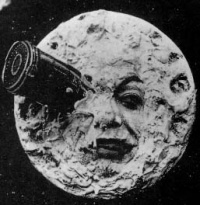 The HBO miniseries From The Earth To The Moon featured a documentary-style recreation of the filming process during its last episode, appropriately titled "Le Voyage Dans Le Lune" in honor of Méliès's work. The music video for rock band Queen's song Heaven for Everyone featured clips from the original 1902 short film. The film also served as the basis for The Smashing Pumpkins' award-winning music video for their song Tonight, Tonight. Unless indicated otherwise, the text in this article is either based on Wikipedia article "A Trip to the Moon" or another language Wikipedia page thereof used under the terms of the GNU Free Documentation License; or on original research by Jahsonic and friends. See Art and Popular Culture's copyright notice. This page was last modified 18:53, 20 April 2012.